The New Milford Rotary Club recently presented its October Student of the Month award to NMHS senior Liam Lacey. Liam is a member of the National and Spanish honor societies, is yearbook editor and a co-editor of the literary magazine, a DECA Club officer, gymnastics team manager and owner of Liam T. Lacey Photography. He has interned at Makery Coworking and volunteers with Our Lady of the Lakes youth group. Liam plans to major in marketing and digital media studies and pursue a marketing position in an art-based corporation. 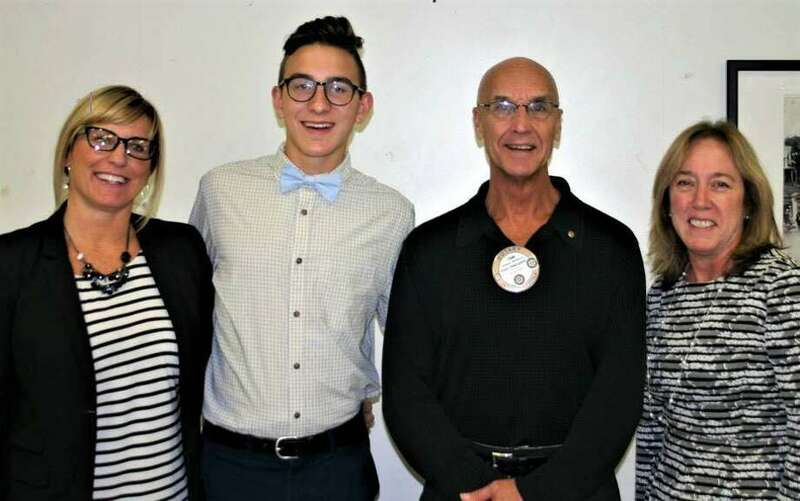 Liam, second from left, is shown with, from left to right, Liam’s mother, Gina Lacey, Rotarian Tom McSherry and NMHS teacher Debbie Knipple.